Coming Soon - A Place To Play. A mother and child stop and peer through an open fence on West 20th Street between 6th and & 7th Avenue yesterday to watch a construction crew demolish a former Department of Sanitation building. Since 2010 Chelsea residents have fought tooth and nail to transform a 10,000 sq. ft, quarter-acre lot into a public park. Chelsea Green park will become a rare, mid-block pocket park in a neighborhood whose residential population has exploded in a particularly park starved area of the city. The park is slated to open in 2019. In the end the city was able to secure three times the number of affordable housing units than what was originally envisioned at the park site. A Win, Win For Everyone. (Photos: Geoffrey Croft/NYC Advocates) Click on images to enlarge. The first new city park to be built in Chelsea in almost 50 years is inching closer to reality. On Friday officials gathered in the footprint of what will soon become a rare, mid-block pocket park in a particularly park-starved area of the city and in a neighborhood where the residential population has exploded. A green space that was fought for tooth and nail. 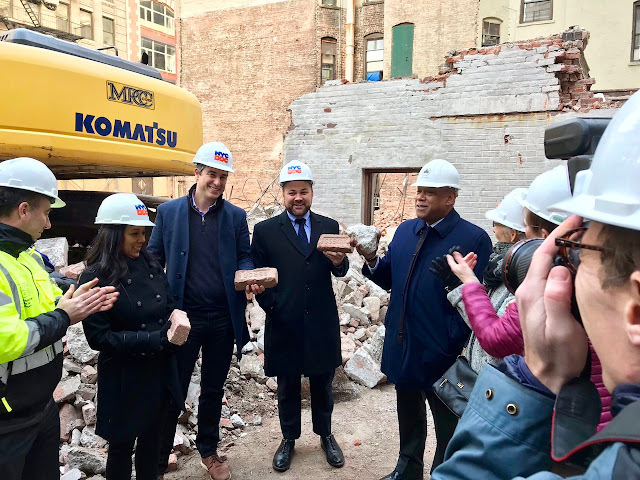 Flanked by large earthmoving equipment and the skeleton remains of the two-story building surrounded by construction debris, representatives including City Council Speaker Corey Johnson, Parks Commissioner Mitchell Silver, and from the Department of Design and Construction and open space community activists gathered for a photo op. Chelsea Green, as the new the $ 5.3 million dollar park will be called is expected to open in 2019, nine years after the community first began its push to create a much needed park space. “Access to green space is vitally important, and for too long, East Chelsea met the definition of a park desert,” said Council Speaker Corey Johnson who, along with the mayor allocated the park’s funding. “This park is one of my proudest achievements in public service. I want to thank Commissioner Silver, the Parks Department and the many community members who made Chelsea Green Park a reality,” he said. This fall demolition began on the old Sanitation Department building where the agency’s Derelict Vehicle Operations office had occupied 136/140 W. 20th Street for at least 65 years. Matt Weiss, a founder of Friends of 20th Street Park, is ecstatic to see the park finally come to fruition. "To be able to finally stand in the actual footprint of the space and realize how substantial it is by New York City standards it made it all real. It’s a real transformation come true,” he said. "Every event like this is just a reminder of all the highs and lows of the experience to get us here and get us one step closer to the final reveal of a great green space." Weiss credits a chance encounter with city Sanitation workers on his way to work one morning in September 2010 that lead to what he refers to as, “an adventure of a lifetime." On that fateful day he said he noticed some commotion in front of the lot across the street from his building, workers were padlocking the gate, so he inquired. They told him their operation at the site was closing and they were being relocated to another borough. Weiss, then a father of a one year-old, said that’s when the lightbulb moment to build a park went off. "Wow the city is vacating this city-owned site how unusual it is where there wouldn’t have to be a cost of acquisition for land and this neighborhood is really starved for green, for parks,” he said. He began sharing his idea with family, friends and neighbors. The remains of the Sanitation Department building in the future park site on Friday. Unwilling to accept the city's historically uneven track record of creating open spaces in needy communities, he made a decision to try and do something about it. A diverse coalition of residents and business owners throughout Chelsea was created and Friends of 20th Street Park was born. A steering committee was formed, a website was created, the group began compiling an email list that kept growing, they felt momentum. "Then we hit a wall,” Weiss said. The group soon found out the property had been promised for affordable housing as part of Western Rail Yards 2004 rezoning on the far Westside. The group researched dozens of potential alternative housing sites but neither City Council Speaker Christine Quinn, who represented the area, the City's Department of Housing Preservation agency nor the Community Board were budging. “It was being told no in the face of what we thought was really good logic that made us so determined to have common sense prevail. The neighborhood needed a park, residential density was booming, there was lots of other opportunities for housing but only one for a park and we just wouldn’t take no for an answer,” Weiss said. The group generated petitions and letters of support, they received the endorsements from twenty-one individual block associations. In January 2011, The Council of Chelsea Block Associations (CCBA), an early supporting organization wrote to Community Board 4 and to local officials asking the board to reconsider its position. “[I]f a park is allowed to be established on the site, many hundreds if not thousands of residents will make use of the park…low income, middle income and upper income residents. It will be much easier to add 75 units of affordable housing to make up for the ‘loss’…as compared to finding space for a park starved community,” wrote CCBA president Bill Borock. Politics continued to block success. Undeterred the group pressed on, for years. 2011. The Sanitation Department building and lot facilitated the agency's Derelict Vehicle Operations office at 136/140 W. 20th Street for more than 65 years. Demolition crews worked yesterday clearing out the last remains of the building. The Department of Design and Construction is demolishing and clearing the space, it will then be turned over to the Parks Department for the construction of play structures, plantings trees, seating, and space for rotating public art displays. Chelsea Green is projected to open by 2019 according to the city. Supporters packed community board meetings, organized social media campaigns, held rallies, met with numerous city officials in this uphill battle. As luck would have it the park movement had a passionate supporter who would become the park’s key political ally in the fight. Community Board 4 member Corey Johnson worked quietly and effectively behind the scenes to help achieve both the community’s park plan as well as the affordable housing component. And then some. These days Weiss thinks a lot about how this has all come full circle. "We had an obstacle in prior leadership" he said. In the end the city was able to secure 220 affordable housing units at 495 Eleventh Avenue compared to 65 that was originally envisioned for the 20th St. site, three times the number of affordable housing units. This alternative housing location was one of the lead sites the group researched and submitted to HPD and Speaker Quinn at the very beginning. The success here which achieved both important goals has not gone unnoticed among open space and community advocates. The de Blasio administration has pitted housing vs. parks in several locations throughout the city as the Mayor has sought to dramatically increase the number of affordable housing units. Rendering of the future park. The park will include play equipment for several age groups, plantings, trees, seating, and space for rotating public art displays. Chelsea Green is projected to open by 2019 according to the city. De Blasio is still pushing various housing plans involving parks and open spaces from Brooklyn Bridge Park to the Elizabeth Street Garden, Mill Pond Park in the Bronx to the Marx Brothers Playground and NYCHA Holmes Towers in East Harlem and Yorkville. The building of public parks and affordable housing are not mutually exclusive. The success here proves that both can be achieved through political will. “So many defeats, so much skepticism not only about our odds but about our motivation," Weiss said. "In the end we played this role of not just compromise but peace maker. We found ways to solve another problem in the city with affordable housing, so to be able to get in the end triple the number of units of housing and a new park it gives me some real optimism that ordinary people in the community can find creative solutions that the government otherwise doesn't see for themselves. You just have to really stick to a cause and believe in it and make a lot of noise and then be very patient,” he said with a laugh. Weiss argues that every political decision should be made with such an open mind. He credits the success of achieving both the park and dramatically more affordable housing to an army of dedicated, tireless volunteers, and a little luck. “It can be done. It took this ridiculous amount of perseverance and determination from a group that really coalesced but it did take some luck," he said. “Corey was instrumental in the success of the park," Weiss continued. "I think what he saw was an opportunity to solve two problems, that's what leadership is….he was just a problem solver, and a very charismatic, optimistic problem solver. We couldn’t have asked for a better council member in our district who happened to become a super powerful leader in city politics," he said. “Years and years of the community working together along with the collective efforts of our elected officials, made this community’s dream for green space a reality,” said Friends of 20th Street Park committee member Sally Greenspan. Ms. Greenspan said she realized the park was actually going to happen when the project won the council member’s 2014 Participatory Budget competition. "Today, I am able to witness the park’s creation as it happens in real time. And soon neighbors will be gathering and children will be playing in Chelsea Green, awesome!” she said. "The process of getting a park has been full of ups and downs,” said Friends committee member Dan O’Sullivan. "At the first community board meeting when we all filed up and presented in favor of the idea I thought logic would be clear to everyone, we would carry the day and construction of the park would commence the next day. Instead, that meeting was followed by hundreds more as we wandered through the apparently hopeless wilderness of existing and competing and powerful agendas. The participatory budget process was the thing that really dramatically turned the tide. At that point, Corey Johnson, who coincidently stood right next to us at that very first community board meeting as the timekeeper ensuring out speeches were not too long, saw the depths of support for this project, took it on and made it happen. I am very grateful for the work Corey has done on this. While I originally was hoping to bring my kids to a swing set, now I am looking for a bench to read the newspaper on in my retirement, the thought of some green space in that neighborhood instead of just plugging that last gap with another building was the right thing to do for future generations,” he said. The campaign helped galvanize a community in a neighborhood long known as industrial. East Chelsea is transforming from a largely commercial district into what has become a vibrant residential community. “Your world can be kind of small in that you just don’t know your neighbors and this exercise brought this community this neighborhood - if you want to call it East Chelsea - together in such a wonderful family sort of way that neighbors know each other now not just on 20th street but on 17th and 18th, 19th,” Weiss said recalling ideas brought up in conversations with fellow steering committee member Sally Greenspan. "They will play in the park and be friends and be part of a bigger community because of this fight and the effort and that’s what people have told me a long time was that’s the point of parks in the first place. So the fact that you build this (community) before the park was even built is really doubly special I think," Weiss said. Matt and his wife Joanna now have three kids - ages, 8, 4 and 2. Their children, along with thousands of others will undoubtably be spending a lot of time in the new park when its completed. The project, created out of love and achieved through steadfast determination will serve the city and many people of all ages for generations to come. One of many events the group organized over the years in order to bring attention to the issue. (Photos: Geoffrey Croft/NYC Advocates) Click on images to enlarge.